Ever want to be a model? Then you’ll love this new hack that combines 3-D imaging and a RepRap machine to turn you into…a model! It’s clever, and hints at two powerful futures for tech. Ever want to be a model? 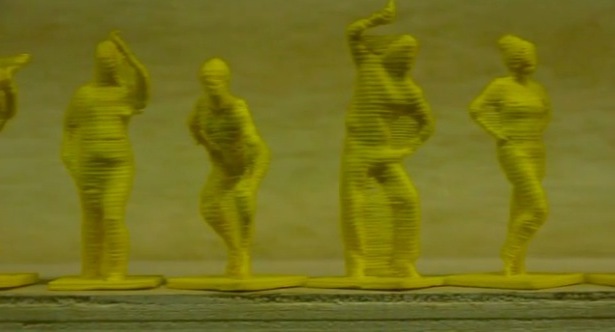 Then you’ll love this new Kinect hack that combines 3-D imaging and a RepRap machine to turn you into…a model! It’s clever, and hints at two powerful futures for tech. Who needs cloning!? We’ve seen any number of clever Kinect hacks in the time that Microsoft’s $150 wonder device has been on sale, some fun, some useful, some teasing at a bold new future for interactivity with computers–this latest discovery is of the latter type. An outfit called blablabLabs set up a street stall in Barcelona that relied on three Kinect sensors, some clever on-the-fly processing in some hacked computer code and a RepRap machine to make impressive swiftly produced mini sculptures. The three Kinect sensors let the team create an accurate 3-D representation of the complete body of a person standing in the center of the array. The 3-D data was tweaked in real-time though a hacked MIDI controller interface to generate the best coverage of the subject, then a Meshlab code was applied to turn the data points into a volumetric 3-D model. Extra tweaks were then carried out and the finished code was whisked off to a Rapman 3.1 open-source rapid prototyping machine that uses melted plastic to build up a tiny physical model in 3-D. The idea was essentially an art piece, tapping into notions of sculpture, public as performers, and tourism (a personal souvenir: Yourself!). But it’s actually incredibly smart–and an entirely open-source idea, with the code released for all to replicate the team’s effort. And more than this, the experiment proves that it’s now possible to make accurate 3-D scans of things, quickly optimize them, and then reproduce them using ultra-low-cost home-made prototyping tools. In one fell swoop, the art piece shows us a near future where we can print out small useful articles on demand, interact in new ways with computers, and take part in a whole new craze in personal art that easily surpasses a crappy holiday photo.